Greenworks Flowers takes pride in servicing some of Houston's businesses. We are a local business commited to giving our corporate clients the best possible service. We are Located in downtown Houston, central to all, and just a phone call away. Whether you need a custom order for your clients or a nice original arrangement for your lobby, we are your florist of choice. 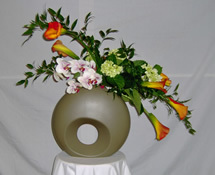 Contact us to discuss the floral requirements for your business, and get a free consultation and quote. Copyright (C) 2016 greenworksonline. All Rights Reserved.